Our recent Three Seas Tour on the Royal Clipper was such an amazing trip. We will cherish every moment of it. As you read in last month’s newsletter, our guests raised over 6,000 euro for the crew fund during the voyage. This was such an emotional moment, as many have sailed with these crew members for so many years. To be able to exceed our previous donations in order to help them when an emergency arises was extraordinary. Sadly, we recently got word that our beloved Royal Clipper bartender, Manolito “Manny”, passed away recently in an Amalfi hospital. Manny has been such an integral part of our charters for over 20 years and Bare Necessities and it’s clients have many fond memories with him. Our owner, Nancy, recalls him starting out as a barback and working his way up to head bartender aboard all three of the Star Clipper ships. Christie remembers his iconic white stripe that he had down the center of his hair. Kat recalls that Manny always had a smile on his face. 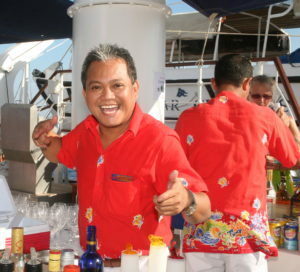 We can’t imagine a voyage without him, either behind the bar or in front of passengers performing his hilarious magic tricks or Elvis impersonations. We have always considered our passengers and the Star Clipper crew as family. Even though we may only see them once a year, we hold so many special memories in our hearts. As we say farewell to a beloved friend, we would love to hear from you if you would like to share a favorite memory or photo of Manolito with us.